Just wondering if you have written any articles on good walks (with a lot of steps) in and around Sydney that would be good practice for Everest? We’d just shared the challenge of walking the Coast Track in one day compared to two (a great place to start), but Paul obviously had a bigger goal of training for Everest base camp trek. It’s not only Everest that lures Sydneysiders. Training for Kilimanjaro, training for trekking Machu Picchu, and Kokoda trail training are all bucket-list items on the 1001 Walks You Must Do Before You Die. 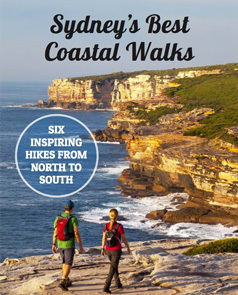 Or perhaps this year demands a challenging Sydney walking event that needs trekking preparation. These are all serious hikes. If you’re doing any sort of trekking training, we assume you’ve researched the risks, have extensive and adequate physical preparation and sought medical and expert advice specific to your destination. What we can help with relates to Paul’s question. Where – in or near Sydney – can you find serious inclines to work those muscles and lungs? So, back to Royal National Park’s Coast Track…. Garie North Head is 110 metres high, and literally starts at sea level – Garie Beach. Thelma Head at the other end of the beach is more than 70 metres high. That would be a very hard training day: parking at Garie Beach and doing laps of the beach (soft sand walking – double win!) then up and down both headlands. It’s exposed and can be hot, so take plenty of water. Refills are available from the toilets at Garie Beach Surf Lifesaving Club but are not potable, so you’d need water purifying tablets. National Park entry fees apply. Sandstone steps, Royal National Park. Image: J. Swift. If the entire Coast Track doesn’t appeal, then the southern section from Otford to Burning Palms is another training challenge (here's the map of Royal National Park). The 230 metre elevation is short, sharp and scenic. While there’s less parking space at the Otford track end, starting from here may avoid the Figure 8 Pools crowd that park at Garawarra Farm. That said, there’s more up and down if you make Garawarra Farm a loop walk to Otford and back. There are no water refills available in this area, so take plenty. There are toilets at Garawarra Farm but none at Otford or Burning Palms. Be prepared. Burning Palms, Royal National Park. Image: J. Swift. Another training bushwalk in Royal National Park is the Honeymoon Track at Audley. Park at the National Park Office on Farnell Ave, Loftus (National Park fees apply). Head past the office buildings to a grassy clearing where the walk is signposted. It’s about one kilometre (and 100 metres of elevation) down, down, down to Reids Flat picnic area. Pack your own picnic, then head straight back up again. Or turn right towards the road and bridge for a short walk onwards to the visitor’s centre and cafe. Extending the walk up to Robertson Knoll (head over the wooden bridge south of the cafe, up the Engadine Track) can be a good addition. Like the relatively quick but steep incline up to Barrenjoey Lighthouse, the Honeymoon Track is a short walk, about 20 minutes one way. So while it offers a good, steep stair section, plan to yo-yo up and down for more bang. The sand dunes at Cronulla’s Greenhills Beach once defined the landscape. Featuring in the original Mad Max films, the now Heritage Listed dunes have been mined, eroded, and nearly completely overcome by housing development. Only locals know how to get to some of the best soft-sand training this side of Stockton. Park in Greenhills Beach car park. At the northern end of the car park is a service trail. Walk along this for about 12 minutes, or one kilometre. The sand dunes are off to your left. Expect it to be busy on a Saturday morning. There are no facilities at the sand dunes, so take your own water. Wear suncream and a hat even in winter as the sun bouncing off all that sand may burn. Nearest toilets are at Wanda Beach Surf Club. In areas, the north west of Sydney is surrounded by national park, and home to some of the most accessible sections of The Great North Walk. It's also where to find one of the toughest training walks, packing a lot of punch into a short distance. Cowan Station to Berowra Waters is a 6km walk with two steep descents (more than 150m elevation change), to creek crossings and an ascent on the other side. Plus a steeper 100m drop to Berowra Creek itself. It's a genuine bush track perfect for building ankle strength over uneven ground. If, like me, you're easily tempted by a coffee or lunch reward, enjoy a punt crossing over to Berowra Waters Fish Cafe. Then either continue on for a more gradual ascent to Berowra or Ku-Ring-Gai stations or go back to Cowan for double bubble. If you've signed up for the challenge of Oxfam Trailwalker, then build this into your training regime. It's the toughest section of the whole 100km walking event. Reader Greg also suggests the Hornsby Heritage Steps on the Hornsby Blue Gum walk for another sandstone stair exercise. Australian mountaineer Lincoln Hall trained for his second Everest attempt by walking up and down the Giant Stairway and Furber Stairs between Katoomba and the Jamison Valley in the Blue Mountains. Expect a descent (and subsequent ascent) of 300 metres elevation of continuous steps each way. Giant Stairway, Blue Mountains. Image: A. Travadi. Ian’s a massive fan of mountaineering books and highly recommends White Limbo, Lincoln Hall’s book on the first Australian ascent of Everest, and Dead Lucky, when Hall ‘died' near the summit on his second attempt (and refers to his Blue Mountains trekking training program). For a less popular walk, park at Govetts Leap carpark. This impressive lookout reveals the truth of all Blue Mountains training walks: that what goes down, must come up (that’s the saying, right?). Starting at 1000 metres above sea level, you go straight down 200 metres, then continue a steady descent another 350 metres to reach Junction Rock at Govetts Creek. Returning the same way, this 3-4 hour walk should turn the strongest legs to jelly. Any walk on the Blackheath side of the Blue Mountains, descending into the Grose Valley, are more challenging and less frequented than walks on the Katoomba side. A Sunday drive along Sea Cliff Bridge north of Wollongong (and just south of Royal National Park) showcases the Illawarra’s dramatic escarpments. It’s an indicator that most walks around Wollongong involve an ascent. While trails such as Sublime Point near Bulli have become popular with large (jogging) training groups, there are less congested tracks equally as challenging. If you are going to tackle Sublime Point, try the car park at the top rather than street parking at the bottom in Austinmer. Alternatively, embrace the steep sections of the Mount Kembla summit walk. Climbing a set of stairs, however intimidating they may look, is insufficient trekking training by itself. For a start, training on uneven ground will strengthen feet, ankle and leg muscles far better than a smooth stair surface. But you may find yourself in the Big Smoke with not a mountain in sight. In that case, incidental stair training adds up. In the spirit of taking every training opportunity, head to Fleet Steps near Mrs Macquaries Chair in the Royal Botanic Gardens. Or to three sets of sandstone stairs from the original docks at Woolloomooloo straight up to The Rocks: McElhone, Hordon and Butler’s Stairs are all challenging. These city-based training sites are all popular with lunchtime joggers. Instead of competing with the active-wear set, focus on weighted backpack training. Reader Marilyn suggests the training walk from Seaforth Oval to Natural Bridge track in Garigal National Park, saying ” This is also a good training track – stairs”. Sure is. The NPWS site delights in describing this very scenic walk as “tough-going” with the section heading down to Bantry Bay via the Timber Getters track as “difficult and steep”. It's like most tough climbs: at the top you'll be rewarded with great views. The best trekking training is in conditions most similar to the destination trek in terms of distance, elevation and terrain. Sydney obviously lacks the mountainous terrain of Everest or Machu Picchu, or the heat and jungle of Kokoda, or the rockiness of Kilimanjaro. But it's best to make do with what's on offer than not at all. These trekking training walks in Sydney will help you on your way. If you're just starting your trekking training program and heading out on your first few overnight walks, check out our Hiking Checklist for what to pack. Tagged 1001 Walks, Books to read, Hiking Camping Essentials.